The Pentagon's unmanned X-37B spaceplane has been in orbit since March 2010 on a secret mission. The online space community was surprised to say the least. A respected British space magazine editor said last week that the Pentagon's secret unmanned X-37B spaceplane was likely spying on a Chinese satellite. The blogosphere erupted with outrage. The spacecrafts' orbits were too different, experts said. Ex-NASA mission controller James Oberg blogged that a "well-respected British spaceflight society" had committed a "horrendous error." Meanwhile, searches on Google Trends for “X-37B” skyrocketed. The report also claimed technology has made space-to-space surveillance a "whole new ball game now." Really? It's common knowledge in the intelligence community that the U.S. has been using satellites to "inspect" other orbiting hardware for half a century, says defense analyst John Pike of globalsecurity.org. What factors are coming into play now that are launching the orbital spy game to an unprecedented level? In the coming decades, satellites are expected to get smaller and stealthier and more maneuverable, experts say, and their sensor abilities will increase with the accelerating rate of technological development. The U.S. still leads the world in space technology, but other nations, including China are closing the gap. The Chinese "recognize the value of space assets and are very rapidly adding to their inventory and their capabilities," says space defense policy analyst Joan Johnson-Freese. "They're coming up in the learning curve." There's a lot of stuff up there. And most of it is floating space junk. In all, about 21,000 man-made objects bigger than 10 centimeters now orbit the planet, according to the Pentagon. An extra 1,000 objects are thought to be active satellites, according to the Union of Concerned Scientists. Tracking them all is challenging enough. Identifying them can be more difficult - especially the stealthy ones. A chief reason to engage in space-to-space surveillance says Pike, is to identify stealth satellites. Critical to the whole equation is something experts call RPO – rendezvous and proximity operations – the ability for satellites to fly close to each other and perform tasks - like spying. RPO development, experts say, is on pace to serve the surveillance community well in the coming two decades. The hardware on the drawing board is secret, of course. But analysts and amateur satellite trackers love to speculate about high-performance, amazingly maneuverable micro-satellites designed to spy on other orbiting objects. There's talk about new, anti-satellite orbiters designed to deliberately crash into other orbiting satellites. Last year China's SJ-12 satellite "bumped" into another Chinese satellite, leading to speculation about whether the incident was an intentional part of an anti-satellite development program. Brian Weeden, an ex-Air Force orbital analyst who now analyzes space technology for Secure World Foundation, looked closely at U.S. Air Force data from the Chinese incident. Weeden doubts that the bump was intentional. "If you wanted to test an anti-satellite weapon system you need to collide with the target in a very different manner," Weeden says. "The approach needs to happen very fast so they have little to no warning, resulting in a 'bump' at very high speeds to destroy the target. The SJ-12 did completely the opposite." The Pentagon has been busy with satellite RPO too. The U.S. Air Force’s experimental satellite XSS-11 launched in 2005 and rendezvoused with the upper stage of its own launch rocket. "Using radar or a telescope on the ground, you're able to get quite a bit of information on a satellite,” says Weeden. “But if you’re able to get up and fly along side it, of course you’re going to be able to get a lot more information." But pulling up to the bumper of these orbiting satellites isn’t easy. Some of these objects are streaking by at more than 15,600 mph. Taking a photo of something under those conditions would stymie Hollywood's most ruthless paparazzi. And optical technology is definitely still in fashion. "You can rotate a camera on a satellite - or rotate the satellite itself - to align it and gather data on another orbiting object," says Weeden. Just last year the Air Force launched a 2,300-pound telescope dubbed the Space Based Surveillance System (SBSS), a low-earth-orbit satellite described by its manufacture Boeing as "a space-based sensor with the ability to detect debris, spacecraft or other distant space objects." Naturally, all spacefaring nations want to protect their eyes in the sky. But Pike says Washington is uniquely worried about somebody "poking our eyes out." "It's because we're located on the other side of the planet from Russia and China," he explains. "It's harder for the U.S. to know what's going on in our areas of concern than it is in their areas of concern." Space-to-space surveillance aims to identify not only the purpose but the technology of satellites. As you'd expect, some of this science is pretty sophisticated. Spy satellite technology has advanced way beyond the ability to simply photograph objects. Multi-spectral or hyper-spectral imaging uses hundreds of different wavelengths of light to “see” what might otherwise be invisible. Different materials absorb different wavelengths of light, which might reveal to analysts what an object is made of. Suddenly an object that’s camouflaged is seen more clearly. Another critical tool is radar. Just last month, Japan launched a radar equipped spy satellite which analysts speculated would be used to spy on North Korea, according to news reports. Weeden predicts a slew of unmanned orbital vehicles that will be used for a whole bunch of different reasons. “Everything from on-orbit inspections, to satellite repair, to re-fueling satellites – or even towards the future - removing debris from orbit." The Pentagon is developing a fascinating RPO-based project called Phoenix aimed at developing hardware that can approach dead, orbiting satellites, grab their useful equipment - like antennas – and re-use the parts to build new satellites right there on the spot. What about the military? The Pentagon's Defense Strategic Guidance for 2012, announced this month, emphasizes investment in U.S. space security. But Johnson-Freese, a faculty member at the U.S. Naval War College, fears it's not enough. "We should be upgrading GPS; we should be upgrading reconnaissance systems; we should be upgrading communications systems," she says. "We should be doing more than we are currently doing." Although the heated Web commentary has cooled off from last week's claim about the X-37B, the question remains: what is the spaceplane's mission? "It may very well have a space-to-space surveillance capability," says Pike. "It may have released test objects that it took a look at." But Pike is skeptical. The spacecraft, which has been in development since 1999 first by NASA, and then the Pentagon's research arm DARPA, and then the U.S. Air Force, has had "many paymasters" and "cooks in the kitchen," says Pike. "It's the nature of bureaucratic projects," he says. "The secret of the thing may be that we spent a billion dollars for no real purpose." Forget satellites. Can we get sharks with some frikken lasers? quit wasting lifes precious time on ridiculous gossip, give the world hope there are people worth meeting when traveling the planet NO NAME CALLING & KEEP YOUR NEGATIVE OPINIONS UNDER WRAPS FOR ONE DAY! ITS GETTING OLD AND SO ARE YOU IM PRETTY SURE THAT WHAT HATE DOES IT AGES YOU QUESTION IS HOW LONG YOU BEEN HATING? An on-demand low orbiting platform could also enhance global unmanned drone operations capability....mullahs beware ! It's just the beginning ... the USA has been able to disable other spy satellites for about a decade, without destroying them. I don't know the code name, but I know it's a bug like name. They use EMS pulses to disable on board electronics. They are ultra secret because they carry a nuclear reactor ... Remember when the Chinese satellites collided and NASA made a big deal as saying that was really stupid because of the debris? The real story is that the hunter US satellite had disabled one of the two satellites days earlier ... the Chinese lost the ability to control it. The American thought it would simply fall into earth atmosphere rapidly, instead it kept orbiting longer than thought ... naively simply nobody thought about such possible, in the aftermath, of course everyone said this should have been planned for, as it is obviously possible. Since that accident, disabling of spy satellites has been re-organized. The vehicle in the picture above is the carrier ... goes up release the hunter satellite, which goes out does the job, then get's retrieved and lands safely. It's truly technology from a science fiction book. This is really where the Pentagon beats Hollywood. 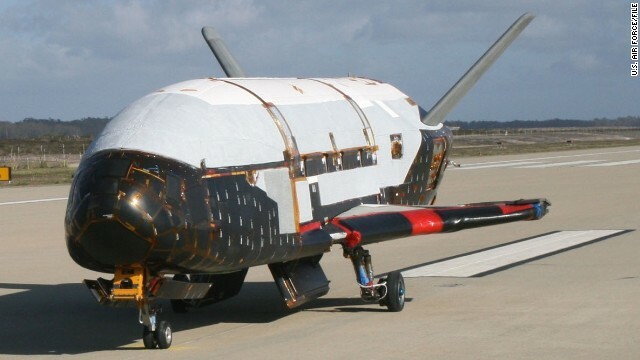 X37-B is in test state right now and will be fitted with weapons that can destroy satellites while in orbit, just like how the predator drone started. BINGO ! But thats the "Obvious." But whats the "Not So Obvious" step after that, The answer "IS" in the Servers. Chinese don't care about war. They take away American War & technology patents. They care about winning space program like USSR. What a waste of money. Just dumb. This thing flew next to another satelite "gavering photos". This "stealth" spy was probably on all cameras of Russian and Chinees satelites upon approach. THis is space – you dont need radar. Things like this will be shinning like a star about 500 miles away. And every satelite has a camera. Are we leading "space technology"? So when is the next launch? Russians and Chineese 20 years behind us? They will never build such a dumb thing. This is just as good as those B-2 1 billion stealth fighters. One missed the apron – and US lost 1 billion. Another one went down a year later – another bililon gone. Actually that's quite untrue regarding the Chinese being decades behind. They have yet to put a man on the moon. We did that 40 years ago. They're decades behind. "They have yet to put a man on the moon. We did that 40 years ago. They're decades behind." We can't do that either. And won't be able to for a decade or two, so I don't see what your point is. America can't run on past accolades. It's like saying the US is awesome because we won WW2, doesn't mean anything in the here and now. The past is the past. When they can send a probe to the outer planets, and return information, then they will be closer to us. But that is years from now, at best. 14 must the cap on the number of comments to this article because it's not posting any more. JP below, if you watched any of the NASA Space Shuttle STS missions, you would already know that there are other intelligences surrounding earth. NASA estimates that there are approximately 12 million objects the size of houses that they can't explain in earth's upper atmos. Some of the more interesting characteristics of these objects include self-illumination, multiple objects performing a perfect circular static formation over the Cape of Africa, and speeds and trajectories that would pulverize a human. The objects have been recorded entering, orbiting and EXITING the atmos. They are watching us, like we go to a drive in theater to watch a bad comedy. Considering we can track a 4 centimeter piece of space junk to know when to move the ISS, I think it would be pretty difficult to hide 12 million (huh??) "house sized objects". If there actually are other more advanced beings out there who are keeping an eye on us, surely they will never permit the human race to escape from our polluted little planet to spread our insanity to other worlds. Absolutely. When reading the news, I often imagine the disgust extraterrestrials would feel observing us. They could be just as bad or worse for all we know, but point taken. We don't live up to our own ideals. It would be much more entertaining news if it was like Mad Mag's Spy vs. Spy. WEDGIES IN SPAAAAAAACE! If it can be militarized and weaponized, the good old USA will let everybody go hungry, uneducated, uninsured and jobless to get it done. What sad and pathetic times we live in. You mean North Koreans, don't you? You'll never buy enough poor to be satisfied will you. The more we've spent on them, the more there are. Gee, I can have as many kids as I want and the goverment will feed and take care of them all? Shoot, well then we can make babies like crazy and one of em is bound to do good and be able to support ole mom and dad, right? Little lottery tickets! ... while kids go hungry and homeless ...but the CIA, NSA, DOD, Pentagon have every toy and piece of bling imaginable. America is sick with military madness. You should run for office and propose a budget that will take care of all the sick and hungry kids. I wonder if this is the thing that knocked out the Russian Mars probe some time back. I have always liked John Pike and his penchant for accurate information. It doesn't matter that the Chinese are 20 years behind in satellite technology, they'll just steal it from us. They aren't good at innovating, all they do is steal ideas and use cheap labor to produce it. You have to learn some history. So I have a question... If the X35 were more along the lines of a search and recover vehicle, would the spying countries admit that the U.S. captured one of their spy satelites? Let's leave the Space Wars to Science Fiction please. Forget the Spy v. Spy stuff. Turn this thing into a giant Roomba In Space and start collecting up all that space junk garbage before it all starts colliding with each other creating a gigantic snowball effect as more and more space junk gets created and runs into more stuff creating even more space junk.... You get the idea. Music swells: "Transformers, more than meets the eye.........."